Both of my boys have a rare neurological movement disorder called Dystonia. It causes painful twisting and contractions of the muscles. The episodic nature of it means that one minute they are running and playing like any other child and the next minute their hands and legs stop working. This means lots of falls and has made my six year old apprehensive about participating in team sports.And then he saw you play. In fact, I never even knew your name until a few months ago. But, it is precisely the fact that we have never met that makes this letter necessary. The truth is, in life we can have an unintentional impact on those around us. As a famous athlete, you know this more than most. So I fully acknowledge that you have no way of knowing the ways in which you have impacted my family, but I do. While I know that you never intended this to happen, I still hold you responsible. It all started when I heard my two little boys calling me as they sat giggling and shouting at the baseball highlights on TV. When I came to see what all the commotion was about my six year old simply asked "Who is that!?" I had no idea. It is my husband who follows baseball, not me. Don't get me wrong; I love baseball. A lot. But my love of baseball has nothing to do with the professional game. My love of the game stems from the fact that my dad, as a child in the 50s, had a female sports role model. As a little boy, when my dad wanted to learn how to throw a curveball, it was his mom's sister whom he called. She had been a pitcher in the pro women's league during the war. According to my dad, his aunt had the "meanest curve ball" and she taught my dad and his buddies all about the game. When I was growing up my dad passed on this love of baseball to me and my sister. It was a wonderful feeling to know that while other dads wished for a boy to play sports with, my dad never did. To him, playing baseball with the girls was as normal as playing with the boys. My dad coached my girl's baseball team and I'll always remember him laughing at the term "throwing like a girl" and reminding us that he spent half his childhood trying to throw as good as a girl. His was a mentality not commonly shared with young men of his generation, and it had a tremendous impact on me and the girls he coached. Growing up I had no doubt that girls could also be fierce competitors and athletes. I have baseball to thank for that. So believe me when I say I really do love baseball even though I couldn't care less about who has been traded and who is putting up the best stats. And this is precisely why I had never heard of you until that day I sat down to watch your highlight reel. Listening to the announcers I learned your name. "Kevin Pillar," I told my son as he cheered at every catch you made. His enthusiasm made me chuckle and I left him and his little brother watching you on TV while I made breakfast. Weeks went by and your name was never mentioned. Then one day, in the most unexpected way I could have imagined, my son said your name. Only this time the words "Kevin Pillar" took on a whole new meaning. The episode, like so many others, left my son sprawled out on the floor. You see, both of my boys have a rare neurological movement disorder called Dystonia. It causes painful twisting and contractions of the muscles. The episodic nature of it means that one minute they are running and playing like any other child and the next minute their hands and legs stop working. This means lots of falls and has made my six year old apprehensive about participating in team sports. But on this particular day when his feet locked and twisted beneath him while chasing his friends, something unexpected happened. "You have given them a reason to play and a way to embrace their disability. In all your athleticism they have found in you someone that they can recognize in themselves." He had been running hard when he hit the ground and he slid across my hardwood floor with one arm outstretched over his head. But instead of embarrassment, his expression showed joy. "Hey!" he said giggling, "Did you guys see that? I looked just like Kevin Pillar!" It made us all laugh. He was right. It looked like a sliding dive he had seen you do on TV. The only thing missing was a baseball in his little hand. "Hey who wants to play Blue Jays?" he asked his friends, who all eagerly agreed. It was amazing to watch him play baseball with his friends for the first time. Not because he didn't fall. He did. But because for the first time in his life he considered it a physical advantage to be like him. To look like Kevin Pillar. You gave him this and for that I thank you. Over the past months, talk of baseball has filled our home as my little boys practice their sliding dives and imaginary throws from center field. My six year old is teaching his little brother about the game and that no matter what he should "always cheer for the blue team." I love that the sport which dominated childhood in my family is living on in my children. You have given them a reason to play and a way to embrace their disability. In all your athleticism they have found in you someone that they can recognize in themselves. You have accidently given two little boys an unexpected hero and in doing so, made the game of baseball inclusive. I don't know how to thank you. But you should know that I'm grateful. Grateful that because of you two wonderful little boys have been given the confidence to play and with it gained back a piece of their childhood I feared their disorder had stolen from them. 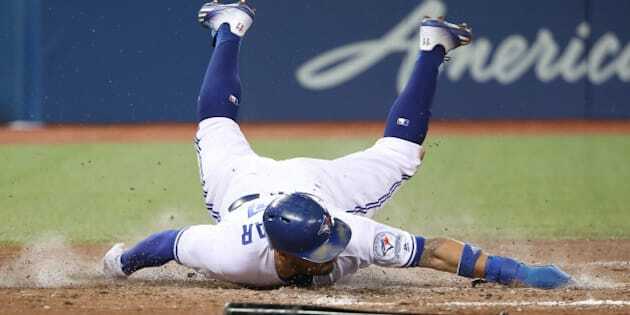 So to you, Kevin Pillar, please keep diving and sliding and catching baseballs. We will be watching and cheering you on. But most importantly, we'll be playing baseball. Go Jays! You can learn more about Dystonia and how you can help at Dystonia Medical Research Foundation.